When a social worker and a truancy officer show up at Finley Rhodes' cottage in Ocean Grove she knows her life is about to change forever. She just didn't realize how much. At sixteen, she'd grown up fast, having the responsibility of taking care of her mentally ill mother, holding down a job to pay the bills and dropping out of school to do both. 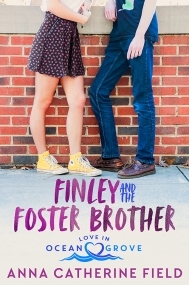 When her case manager tells her she's being placed in foster care, Finley never expected her new home to be in the exclusive gated community and she certainly never thought she'd attend The Academy, a school for the privileged and elite. But the biggest surprise comes from down the hall. Her new foster brother, Chase Powell. Chase Powell grew up in the shadow of his famous model mother, living a life of fame and excess. After a dangerous accident Chase is sent to live with his grandmother in Ocean Grove, where he settles into a life of normalcy and routine. Until Finley moves in. Late night talks, a game of truth, and revelations about their fears bring these two closer together, but it’s not like they can ever be more than friends and even if they could, does Finely worries that her whole life can be taken from her once again. What’s the point of falling in love? A heartwarming tale of first love. Finley hasn't had it easy. Her mentally ill mother can't care for her in a way a mother should, forcing Finley to drop out of school to support them. When a truancy officer shows up at her home, life as she knows it will never be the same. Her mom needs help, but in order for her to get that help Finley has to go into the foster system, moving across town to live in a mcmansion with a stern older lady and her too-handsome and too-off limits grandson. What follows is a sweet story of two people who need each other more than either of them realized. There's something very endearing about these two and everything they go through for each other. As soon as Finley moves in, they fall into an easy friendship, pretending it's that of brother and sister - supporting each other at sporting events, riding to school in the same car, and eating dinner together every night. It's very normal in a way neither kid has ever experienced before. They're both learning how to be a family after their parents let them down. Chase is just as sweet as can be, always looking out for Finley and keeping her true reason for being there a secret. There's little not to like about these two. There isn't a ton of drama. Everything is resolved very easily after it happens. Even Chase's old model fling showing up is nothing more than a cursory appearance that means nothing. I loved this story and wanted more. I wanted to feel as if the characters would have done anything for each other, that they had this passionate love rather than a like. A story that will appeal to all fans of YA romance with great characters and an easy, engaging writing style. My only question when I finished this was 'when can I get the next book? ".